'Csardas Princess' (J. Griffin Crump, R. 2009). Seedling# 052M1. TB, 34" (86 cm), Late midseason bloom. 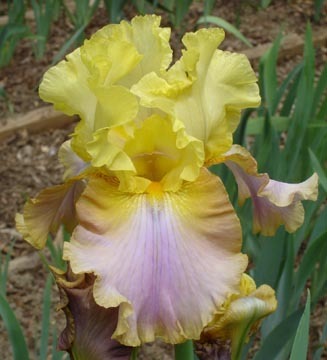 Standards bright yellow, more intense at edge; style arms yellow; falls rose lavender, shoulders gold inner, caramel outer, upper gold wire edge transitions to 1/4" lower band; beards yellow; ruffled, swagged. Seedling# 120K1: ('Double Agent' x seedling# 95S4: (seedling# 93N8: ('Wabash' Seedling x 'Congo Song') x 'Ringo')) X unknown. Griffin's Den 2013.